It is said that dragonflies bring success, victory, happiness, strength, courage, and adaptability. They have two set of wings but can fly with one if need be. They zip and zoom around flowers, ponds and ever around the world. They are fast. They are known for their ability to hover in one spot for a very long time as well there darting from place to place. They are amazing insects. They have a wonderful ability to adapt to their surroundings. Dragonfly jewelry is made from around the world. The dragonfly necklace for example you see in this photo is designed in Bali from an artist named Putu Putri. Her family is well known in their village for the silver they make because it is of good quality and the designs are very much admired. Due to being inspired by her family, Putu decided to go out on her own to make her own designs of traditional and modern designs. This particular design is made of sterling silver with an amethyst stone in it. It is intricately made. It is called the ‘enchanted dragonfly’. I think the name seems very fitting since dragonflies have a lot of enchanted travels as they flitter around the world. Like us humans we have our own enchanted travels in life that gives us the same qualities that a dragonfly stands for. 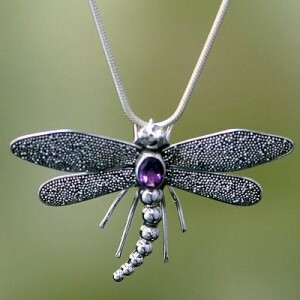 Any dragonfly lover will love receiving a beautiful winged dragonfly. See a beautiful selection of dragonfly jewelry that is designed around the world.